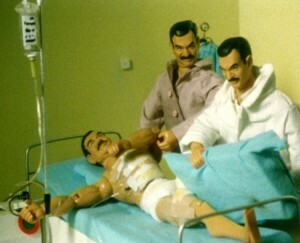 Fragments from the Iraq war reports shown on German television are reconstructed frame by frame with action figures sold in the USA, suitable for children over 5. Karl Tebbe was born in 1970 in Dortmund. He was an exchange student in the USA and then studied Arabic in Cairo. He graduated in Applied Theater Science at Giessen University in 1996 and acted in several theater performances, mainly with Veit Sprenger, in Germany, Tunisia and Jordan. He then studied Cinematography at the University of Applied Sciences in Dortmund and attended the International Film School in Cuba in 2002 as part of an exchange program. His films include: the shorts Mumie (1998), Instant (1999), Moerderball (2002), Monster (2005), and Infinite Justice (2006).